One of the hardest parts of buying a safe is getting it home or to your office and installing it. 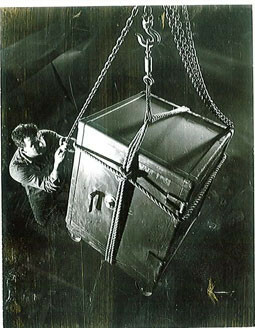 Safes are heavy, and moving a safe yourself can be dangerous. While it's possible for you to get the proper tools and a couple of strong guys to help you, we recommend you use the services of professionals to deliver and install your safe. When you hire "OZ" Trucking & Rigging, you get the benefit of years of experience that we have moving and installing safes. Our safe installation projects occasionally require large vaults being moved up or down multiple stories. In this case, when high capacity elevators are not available, we complete the installation using our heavy duty rigging equipment. When dealing with a home safe installation, keep in mind that installing a safe without getting hurt or damaging your safe, hiring a professional actually saves you money. We have the equipment for the job, and our professional safe installers have the experience to do the job right. Whether your installation is residential or professional, and whether your safe is small or large, “OZ” Trucking & Rigging can help you! Although our work is mostly in and around New York City, Long Island and the New York tristate area, we install any kind of safe virtually anywhere. Click any image to view a slideshow and press [Escape] to return to page.